I commend your attention to everything in this edition of Always Learning, but what I really want to talk about is the Early Learning Center. For years, many of you have been working to build a center for infants and toddlers that would remove all the perverse incentives in the current system, a center that would engage both mothers and fathers, and a center that would ensure long term success through abiding graduate support. Now, thanks to so many great people, it is finally happening. Founding Teacher and Principal (Dr. Michelle Gomes Sanchez) and our Director of Student Support (Emily Centeio Bautista ’02) are admitting expectant parents. The classrooms are furnished, and the place looks more welcoming every day. The official ribbon cutting will be next fall when the babies and their teachers have settled in, and the whole thing is becoming real. It is awesome, and you make it possible. Thank you! Years ago, Peter Keating coined the phrase “Always Learning” for this newsletter, and it is perfect for a school like ours where we are never complacent. Things may be good, but we can always do better. Over the next two weeks, I will be in Rwanda on a “Learning Journey” with the other Barr Fellows, and I expect to learn a lot, but most of what I have learned and much of what I will learn in this life is and will be from my family and from you: Epiphany’s donors, teachers, volunteers, parents, graduates, and students. Together, from our diverse perspectives, we have come together to do amazing things. God bless you all. Breakfast is the most important meal of the day, especially for our children, and so we are proud to partner with Action for Healthy Kids an organization that also believes breakfast is crucial and contributes to academic success. Since Fall 2016, with their help, our students have been eating breakfast during homeroom instead of earlier in the cafeteria. Serving breakfast in the classroom has allowed teachers to provide a calm environment in which students can eat together and prepare for the day. Less food is being wasted when served in the classroom versus the cafeteria, and we are now using that early time for open gym, board games, and homework. Action for Healthy Kids grants have served more than 44 million schools since 2009. Their alternative models of eating breakfast, such as Breakfast in the Classroom and Grab and Go, have been extremely beneficial to Epiphany, and we really appreciate their support. 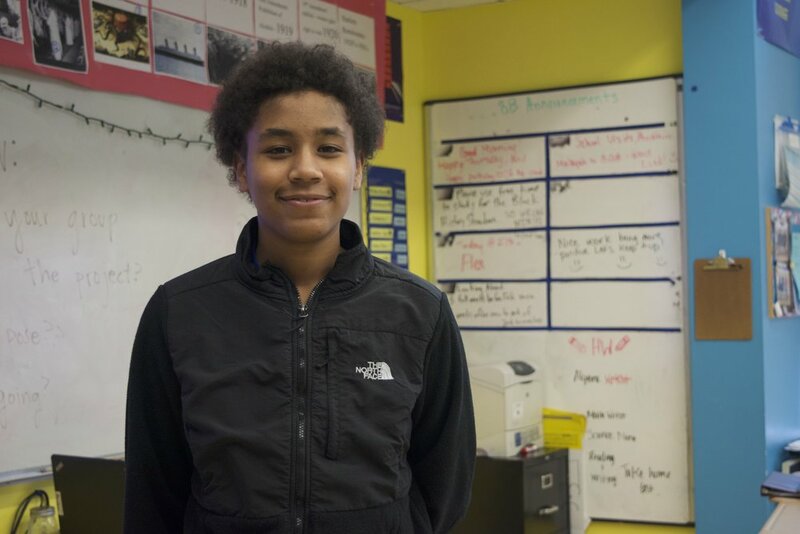 This month’s star is Adelino Fernandes, a current 8th grade student. When Adelino first came to Epiphany, he was reserved. He loved the caring environment, but it confused him. What was this place? He felt disoriented by all the teachers’ love and attention, but soon enough he adapted to the school’s culture. Now, looking back, Adelino is grateful for what Epiphany has done for him over the years. He has finally completed all of his high school applications and is waiting to hear back. The application process was “stressful and long”, and he is worried about whether he will be accepted, but he is thankful for the support system he has at Epiphany, in particular Mr. Wilson, Director of High School Placement and Transition, who guided him through tough times. We know that whatever school gets Adelino will be lucky to have him. He is very excited to start his new chapter in high school but also very sad to leave Epiphany. He says he will remember Epiphany as the place that prepared him to be a thoughtful person and to stop and listen to other people. He says he will cherish all the moments at Epiphany, especially last year’s Boys Lock-In where all of the boys slept over at Epiphany to build camaraderie and community as they played games and cooked together, and he looks forward to returning as a volunteer. We are proud of Adelino. He will be missed, but we expect to see him at reunions and the other graduate support events. Adelino Fernandes in his homeroom. At the end of the South African unit in Mr. Deleveaux’s 7th grade Social Studies class, students came up with creative and source-based poems and raps to demonstrate their understanding of the dates and facts they had learned. Students had just 15 minutes to write their poems and recite them in front of their peers, but these talented kids did a great job. We love seeing our students use their creativity to embrace academic content. Watch the videos below to see how creatively the students learn the material. Our 5th grade students presented their Endangered Species Projects to the school on Tuesday, January 16th and Wednesday, January 17th. They shared interesting facts about some of the world's most vulnerable animals, presented a book they created, along with clay models and life-sized outlines they've been working on since the beginning of December. We love seeing our 5th graders take pride in their work and become experts about different animals! An Epiphany family lost their home and everything they had in a fire on Saturday, January 6. We are so grateful that all of the residents are safe, but they face a long road ahead of them as they work to rebuild their lives. The one bright spot has been seeing how the community has come together to support them. Please see the below article for more details, and for a link to a fundraiser to help the residents begin to replace what they've lost. Once again, thanks to the leadership of Erika Forrest, Director of Graduate Support, a group of our students went to City Year to volunteer on Martin Luther King Jr Day. It was a great experience for our students to support the community that surrounds MLK Boulevard in the heart of Roxbury. 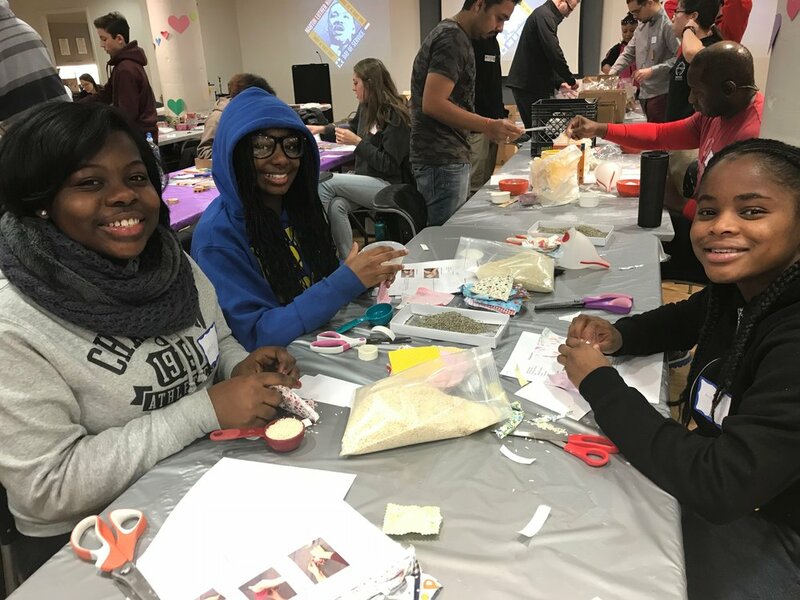 The group was accompanied by three staff members and spent a few hours making hand warmers with rice and hygiene kits for the families. We are very proud when our students perform community service and give back. On Friday, January 12, a few graduates who started college this fall met with the current 8th grade at the new Graduate Support Center at 230 Centre Street to discuss goals for the future. These inspiring freshmen discussed their high school experience as well as their experience transitioning to college. Our 8th graders now have a better sense of the goals they should be setting now and to help them anticipate any potential rough spots they may have to navigate in coming years. On Wednesday, January 17, the Kuumba Singers of Harvard College came to Epiphany for a tour and lunch and then shared their beautiful voices with us. They are amazing, and the effect of hearing all their voices in harmony was so powerful. We enjoyed getting to know them and having the opportunity to ask them questions about college. One of our wonderful Teaching Fellow, “Ms. Z”, sang in Kuumba in college. She arranged the trip. At the end of the concert, she got pulled up to sing a solo and she blew us all away! Tickets and tables are now on sale! Click here to purchase tickets, a table, or to become a sponsor!